One local police department noted that officers to the south saw sun while those to the north were "dealing with hail and torrential rainfall." Strange weather greeted spring in Southern California Wednesday as hail, rain and sunshine mixed it up, and a major freeway was closed as a result of flooding. The 710 freeway in Compton was shut down for more than an hour in the afternoon as drivers in both directions were faced with water deep enough to strand their vehicles, said Officer Siara Lund of the California Highway Patrol. Traffic was diverted onto another freeway. Compton Fire Department Chief Ronerick DeKeith Simpson said rescuers were called on two reports of stranded vehicles on surface streets. No injuries resulted. An NBC Los Angeles helicopter captured images of streets, parks and rooftops in southwest Los Angeles County covered in white hail, despite temperatures in the region being in the low 60s and bright sunshine in other neighborhoods not far away. 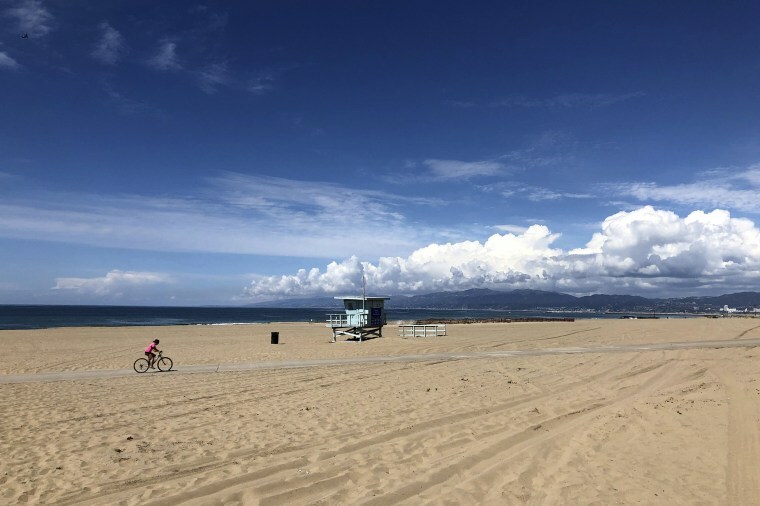 The nearby Long Beach Police Department noted the bizarre weather in a tweet that said officers to the south saw sun while those in the northern part of the city, which abuts Compton, were "dealing with hail and torrential rainfall." One storm cell near the Orange County-Los Angeles County line produced "heavy rain and dime size hail," according to a tweet from the National Weather Service in Oxnard. NWS meteorologist Kristen Stewart said a separate cell sat over the Compton and Long Beach areas for nearly three hours Wednesday afternoon and dumped rain and hail. She said "a convergence of winds" from the west and south worked to sustain it. "You had this storm just sitting there," Stewart said. In just a few hours it dumped at least 1.57 inches on Compton -- a rare measurement for a few hours worth of precipitation in urban Southern California, she said. The weird weather was created by a classic winter storm from the Gulf of Alaska that contained cold air in its uppermost levels, Stewart said. The rain and hail was expected to clear out Wednesday night but a separate, smaller front could bring rain back to Greater Los Angeles Thursday, Stewart said. Dennis Romero writes for NBC News and is based in Los Angeles.